As a multi-award winning Sage 200c Business Partner, we have designed and developed our Sage 200c training to help you get the most from every session. We understand how difficult it can be to find the time to fit in training, so we want you to come away bursting with knowledge, ideas and enthusiasm that you can put to use. Practical expert training that helps you absorb information faster, to get you up and running as quick as possible. We provide training both online and onsite, depending on your schedule and your preferred learning experience. All of our training is tailored to you as an individual. Training shouldn’t be boring, we choose our trainers for their personality and enthusiasm... did we mention that we are Sage 200c Specialists? Our expert trainers really know their stuff! If we are coming on-site we will do a full days training, with short breaks and a break for lunch. If you are having training in our virtual classroom, we understand that without the face-to-face teaching, it can be hard to keep focused. Luckily our online training sessions are 2 hours long, making sure you can fit it into your tight schedule! CAN YOU DO CUSTOM TRAINING COURSES? We offer bespoke training packages, available both online and on-site. We can create a training plan that helps us to maximise effectiveness of the training and allows us to focus on training you in areas that will be most beneficial to your users. We can also plan for different users to attend different aspects of the training. WHAT IS THE DIFFERENCE BETWEEN BEGINNER AND ADVANCED? All of our courses are available in beginner and advanced. Beginner is for both inexperienced and intermediate Sage users or maybe you just need a refresher to remind you of the features in an area of Sage. Advanced is for users who consider themselves beyond intermediate and want to expand their knowledge of Sage. Not at all! We pride ourselves on our flexible training courses. Ensuring no matter what business type, user levels or experience levels, we can make sure our training course is crafted to your needs and requirements. Our online courses have a set syllabus and offer training in smaller chunks. They run on set dates during the month. This is great for individuals who want a cost effective option or for those that just want to know the core information and don’t have complicated Sage 200c set ups. Is 'Online Training' for me? Our onsite Sage 200c training offers a much more tailored approach. We work with you to design and plan the training session, using your own data and in the convenience of your own office. There is no extra cost for additional attendees and you choose the dates that suit you. This is great for teams, for those that want to learn using their own Sage 200 setup and processes or for those that want more than just the core information. Is 'Onsite Training' for me? 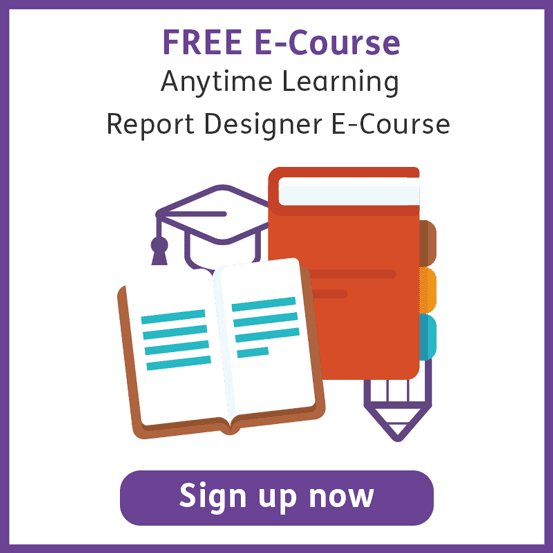 Our introductory Sage 200 Report Designer Training course is intended for inexperienced or intermediate Sage 200 Report Designer Users. We cover everything you need to know to start using Sage 200 Report Designer. This course is available in both beginner and advanced. Sage 200 Business Intelligence is a free reporting tool built into Sage 200 2011 and above. It allows for dynamic excel reporting in a pivot table style format. Throughout the course candidates will be shown how to create and modify their own reports and by the end of the course will be confident in understanding the use of BI. Sales and Purchase Ledger: customer accounts, analysis codes, invoicing and credit notes, posting payments and receipts, allocating, reversals and corrections. Views and transaction history. Cash Book: posting and period end routines, bank feeds, inter account transfers, setup DD and SO’s, bank reconciliation. Nominal Ledger: overview and structure, report categories, nominal transactions, journals and journal templates, accrual and prepayment functions. Reporting: options, sorting and filtering from each of the modules, importing and listing. Invoicing: Raising, printing and posting invoices and credit notes through the new invoicing module in Sage 200c. Sales order process: allocating stock, despatching, printing, sales returns, amending allocations and dispatches. Workspaces. Purchase order process: entering and printing orders, receiving stock and free text; GRNs, Invoicing and disputed invoices, purchase returns, amending orders and authorisation. Stock module: stock items and product groups. Locations, suppliers, alternatives and analysis codes. Managing your stock levels from within the stock control module and performing transactions such as write offs, revaluations and stock takes. Reporting: Key reports to run, customising your criteria and amending lists and workspaces. If you feel you would benefit more on a one-to-one style training or you want to cover more than our standard course, we can offer bespoke training tailored to your requirements. Training can be provided on a one to one basis or for a group of employees and can be provided in a virtual online classroom or in your offices. Full course materials will be provided and virtual environments can be created where required. The bespoke training options allows for full flexibility around your business and timing needs. Power BI is a cloud based business analytics service that gives a single view of your most critical business data. Monitor the health of your business using a live dashboard, create rich interactive reports with Power BI and access your data on the go with native Power BI Mobile apps. Solve problems as they occur and seize opportunities as soon as they arise. You can ask questions in natural language and get the right charts and graphs as your answer. Create and publish content packs to your team or your entire organisation. Content packs can include dashboards, reports and datasets that provide every user with a personalised view of their business metrics that matter the most. We offer training on the latest versions of Sage 200 and in particular offer a new features training course for Sage 200c. Sage 200c presents a fresh and modern look and feel with a new user interface. Improved navigation and usability enhancements provide the means for speedier data entry, easier error correction and ease of navigation. Note: Feature access is dependent on the modules included within licensing. This course covers enhancements from all modules.